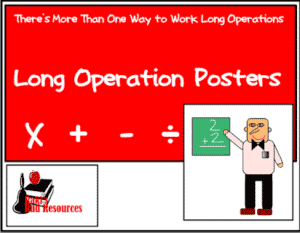 Regrouping, borrowing, carrying, long division, multiple digit multiplication, there are so many different ways to explain “long operations” that sometimes I have to clarify to parents what it is that I’m talking about what I start discussing long operations. Parents (and probably most teachers too) learned the long division algorithm or the long subtraction algorithm in one specific way growing up. They were taught that this is the ONLY way to do math and these are the ONLY words to use to describe the process. So when we introduce words like regrouping the parents and grandparents who are trying to help with homework they feel overwhelmed. This is true for American parents who grew up with “old math” and “new math”, but it’s even more true for parents who didn’t grow up here. I’ve taught overseas and I promise you that our way of subtracting, dividing, etc. looks VERY different than way they grew up with. Since many of these parents may also have limited English, they really feel isolated when it comes to helping their children with math homework. So how do we bridge the gap? 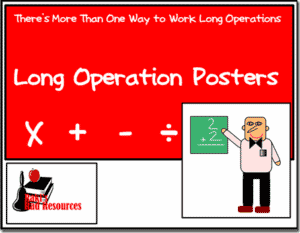 Well my long operation posters are a good place to start. What does long division look like? When I was teaching at an International School in Morocco, I had a parent night where I stood and discussed long division (which I had recently taught) to 6 parents from 6 different countries. Each parent showed me a different way to “do long division”. They each got the right answer, but each looked completely different. Blew my mind! So I took a picture of their equations and went home to figure out how I was going to bridge this gap. What I realized was that each equation (mine included) could be broken down to one of 3 algorithms. What was actually different was which information was written down and which information wasn’t – their short hand. We always do some math in our head. Each parent had been taught different long division steps to write down. They were also taught to write them in different locations. 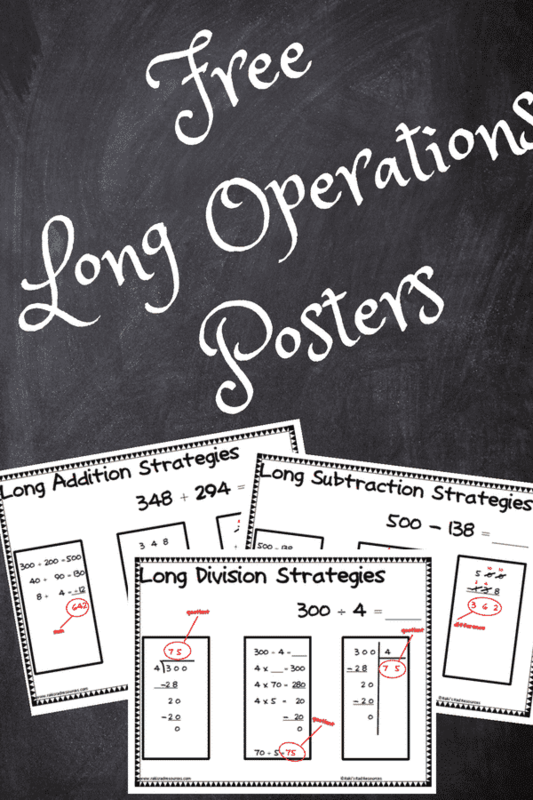 So I created my long division poster which had a long division explanation for each of the 3 algorithms and the next day my class and I went over the three different algorithms. We learned how they were the same, how they were different and how their particular “short hand” could be solved that way. We added these sheets to their interactive math notebooks. Then their homework that night was to go home and explain the sheet to their parents. Totally changed the way those students – and those parents – viewed math. After that, I got to thinking that long division wasn’t the only operation done differently. My husband’s subtraction looks WAY different than mine. So I started playing around and came up with a poster for addition, subtraction, multiplication and division. Each year I have my students add these posters to their interactive math notebooks. Not only does this help the kids explain our algorithm compared with their parents’ algorithm, it also gives them the idea that there’s more than one way to skin a cat. In math there are often many different ways to solve a problem – even long division. I no longer teach students that these are the steps to long division and you must memorize and repeat them. Instead I teach students to understand the steps so that they can choose how to implement them. 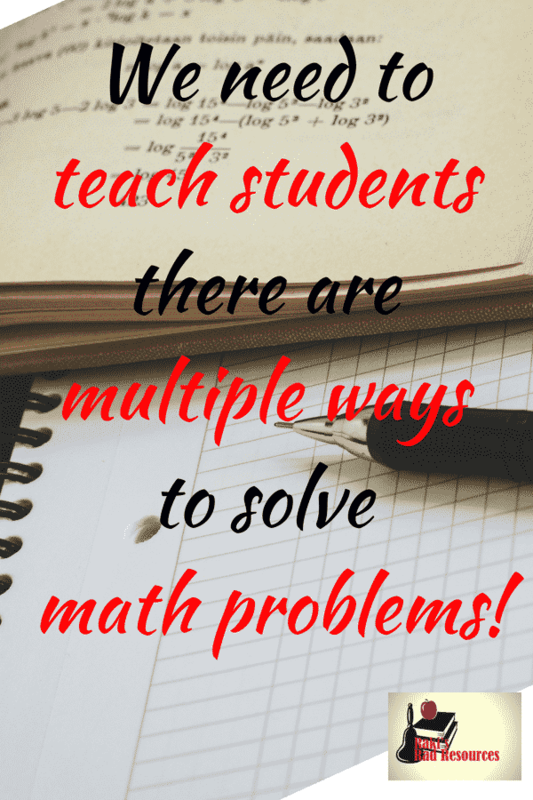 Math is about problem solving, not memorizing and these free posters can help your students understand that it’s okay to solve a problem in a different way. Download these free posters by clicking on the image above.